For education information, please contact Helen Williams or Katie Brennan. 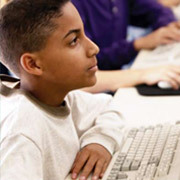 The Cleveland Foundation has invested in education for more than a century. With our partners and donors, we aim to reinvent public education in Cleveland and to significantly increase postsecondary readiness, enrollment and success among students and graduates of Cleveland Metropolitan School District (CMSD). Services: Students and their families receive the necessary in-school and out-of-school academic and social support services from pre-K through career launch, which can include tutoring, legal aid, and medical care and access to high-quality out-of-school programming. Sustainability: Multiple generations will benefit because of the long-term framework being built and the corresponding governance structure. Learn more about Say Yes Cleveland here. We support PRE4CLE, a partnership to create more high-quality pre-school seats and help families better understand and access available high-quality programs. 4,800 children are now enrolled in high-quality pre-school programs—a 69 percent increase since 2014. Since 2012, the foundation and partners remain deeply involved in the implementation of the 2012 Cleveland Plan for Transforming Schools. We work to ensure every family in every Cleveland neighborhood has a variety of great schools from which to choose. We aim to align students to the current and future economic opportunities of the region. Support True2U mentoring program to connect every CMSD 8thgrader with an adult mentor. Learn about True2U’s impact here. Co-created the Top 50 Scholars Program with College Now to help high-performing CSMD seniors access selective colleges and universities. Helped create the Higher Education Compact in 2011, a group of over 70 organizations focused on getting CMSD students to and through college. Awarded more than $3 million in scholarship support in 2017.